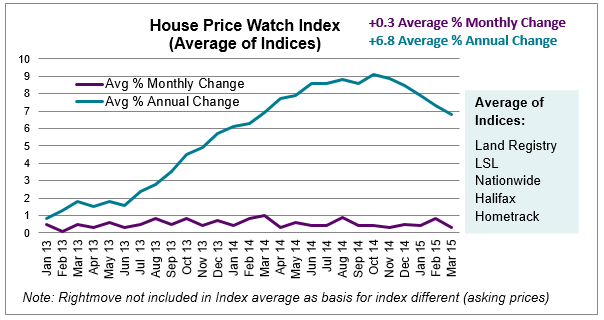 Average annual house price growth dropped from a peak of 9.1% in October 2014 to 6.8% this month (a return to the level reported a year ago). Completed home sales in the opening two months of 2015 are down 9% compared to a year ago. LSL using Land Registry data estimate the number of housing transactions in England & Wales in February 2015 to total approximately 64,500 (down 7% on Feb 2014) and in January to total 66,500. Combined sales of January and February are 9% lower than a year ago. The recent modest rise in approvals in January to 60,786 follows five successive monthly declines between July and Nov 2014. 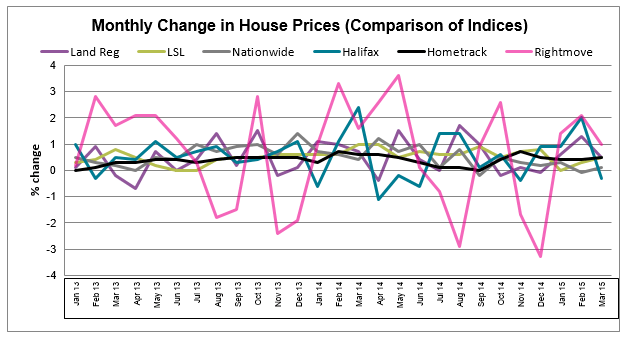 (Bank of England figures reported by Halifax). The CML recently published its analysis of mortgage lending for house purchase in 2014. The greatest number of mortgages were given to home movers but loans to first-time-buyers and buy-to-let investors increased the most versus 2013. Whilst lending may be up, first-time buyer numbers remain low relative to historic levels (annual average over last 35 years was 415,000). Government schemes such as Help to Buy have helped first-time buyers – 78% of the 40,000 approved loans as of the end of 2014 were to first-time buyers. Recent reform to pension rules will make it easier for pensioners to purchase investment properties and may help boost market activity in the months ahead. Investment divisions of estate agents are already reporting an uplift in enquiries from ‘granlords’ – first-time, retirement age, buy-to-let investors (Rightmove). Newly listed properties increased last month, though supply remains tight. 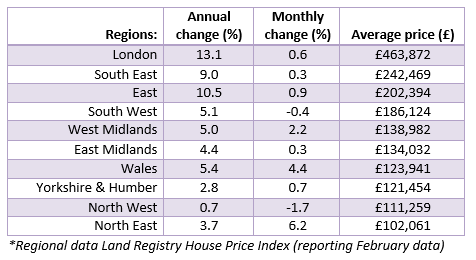 Rightmove indicate that new listings are up 3.2% compared with February though first-time buyer properties have seen the lowest increase in supply (+2.6%). Despite relatively strong rates of house price growth in recent years, there has only been a modest pick-up in house building (approximately 119,000 new homes in 2014). House building increased in 2014 (up 8% on 2013) but tailed off in the final quarter of the year and remains 33% below pre-financial crisis total in 2007 (ONS data).